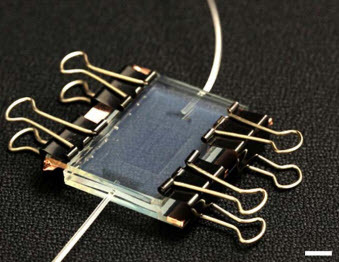 Prototype biomimetic electronic-leaf photovoltaic device. Scale bar: 1 cm. Solar cells based on organic systems have the potential to become less expensive and more environmentally friendly than silicon-based solar cells, the current industry standard. But the sun’s ultraviolet rays deteriorate their performance. Now North Carolina State University researchers Orlin Velev and Hyung-Jun Koo have designed solar-cell devices with channels that were inspired by the branching vascular channels that circulate life-sustaining nutrients in leaves and human hands. 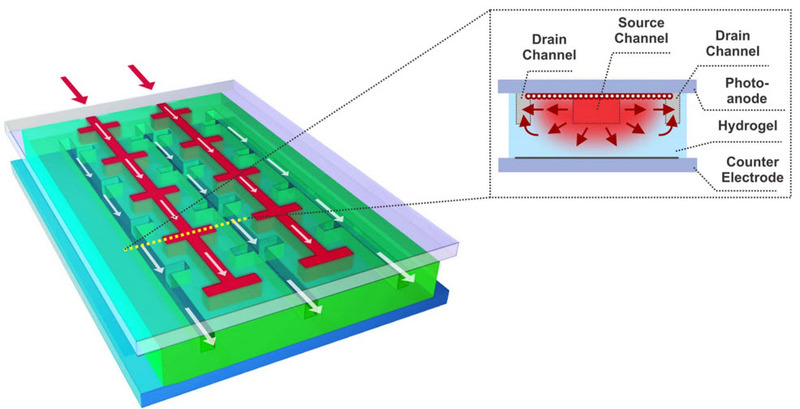 Schematic of biomimetic photovoltaic device (photo above) with microfluidic replenishment network.Left: The white arrows indicate the convection-dominant transport of dye and electrolyte molecules along the microfluidic channels. Inset: cross-section view across the dotted yellow line. Tin oxide nanoparticles and platinum catalysts are deposited on the photoanode and the counter electrode, respectively. The red arrows indicate the lateral diffusive/convective transport between the source channels and drain channels. These biomimetic (nature-mimicking) devices are a type of dye-sensitized solar cells (DSSCs). They are composed of a hydrogel (water-based gel) core, electrodes, and inexpensive, light-sensitive organic-dye molecules that capture light and generate electric current. “Organic material in DSSCs tends to degrade, so we looked to nature to solve the problem,” Velev said. “We considered how the branched network in a leaf maintains water and nutrient levels throughout the leaf. Our microchannel solar cell design works in a similar way. Velev, Invista Professor of Chemical and Biomolecular Engineering at NC State and the lead author of a paper in Scientific Reports (open access) describing the research, adds that the new gel-microfluidic cell design was tested against other designs, and that branched channel networks similar to the ones found in nature worked most effectively. Study co-author Dr. Hyung-Jun Koo is a former NC State Ph.D. student who is now a postdoctoral researcher at the University of Illinois. The study was funded by the National Science Foundation and the U.S. Department of Energy.